Having hunted vampires earlier in the year, Abraham Lincoln now turns to the rather more serious matter of the abolition of slavery in STEVEN SPIELBERG’S acclaimed biopic LINCOLN. 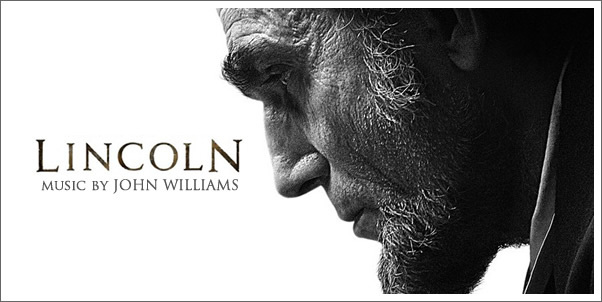 Having gone through a slew of rewrites in the pre-production stage concerning just which portions of Lincoln’s turbulent and eventful presidency to cover, the final product eventually honed in on just the last four months, dealing with the struggle to pass the slavery-banning 13th Amendment, the wrapping up of the Civil War, and ultimately the fateful visit to the theater on the night of April 14th, 1865 (spoilers?). It being a SPIELBERG picture, and one concerning a prominent figure of American history no less, there was never even a shadow of a doubt that JOHN WILLIAMS would return to grace the production with his usual respectful sense of Americana. Listeners familiar with the maestro’s career will find absolutely no surprises in LINCOLN – it sounds exactly the way you would expect it to. And in a way, that is a comforting fact considering that the octogenarian’s legendary career is slowly but surely coming to an end; there is only so much new WILLIAMS music we’re going to be hearing, and each and every score is to be treasured.